So, I completed my flickr project to take 100 candid stranger portraits. While I spoke to some of the people I photographed the vast majority were bypassers. At times I enjoyed the project and at other times it felt very awkward. My intention was to use this personal assignment as practice for another one hundred strangers project that will push me both technically and sociably. Its funny that my job puts me in positions where I have to take control of some demanding situations and people/strangers often look to me to control many many different and difficult environments. During my working day I have to appear confident and totally unfazed by anything I have to face. At times my job can be physically and mentally demanding. Funnily I’m also often photographed and recorded. Now, put a camera in my hand and ask me to approach a total stranger, speak to them and ask if I can take their portrait… It is totally nerve-racking! Its different from my job. At work I have a tacit knowledge of what needs to be done, how it needs to be done and a pragmatism to get the job done. When it comes to photography and I approach a stranger I feel anxious about how they’ll react. I don’t feel particularly confident in how I should go about directing them as a model and I just feel like I have too much running around in my head…. exposure, shutter speed, chatting, pose, background, am I holding the person up…. I actually feel a bit rushed and hurry myself far too much because I am worried about taking up the persons time. Perhaps unnecessarily because if they were in a huge hurry they wouldn’t agree to having their portrait taken. Anyway, I find it difficult to engage strangers in conversation and this new 100 strangers project is going to be tough. I hope it will get easier as time goes on and I certainly want to improve my portraiture along with my understanding of the use of natural light, flash photography and light modifiers. Below are my first three strangers that very kindly agreed to take part in the project along with a little description that goes with the images. This is Chris. He is #003 in my 100 strangers project. I went to a gig at the 100 club on Oxford Street, London. Then on to The 12 Bar on Denmark Street who had a late night DJ. A Rockabilly/Psychobilly band called King Kurt had been playing. Their gigs can get a tad messy. That is actually an understatement. I once had to walk a good few miles to get home after seeing them play. I could not get a taxi and the bus drivers would not let on the busses. I was covered in flour just like Chris who was the DJ following the live music. I actually went up to a balcony to photograph the aftermath of the gig and stumbled across Chris. I had a quick chat about the gig, previous gigs I had been to and the joys of getting home in such a state. I told him about the project. He agreed to his portrait being taken. My batteries had died in my flash and I wasn’t really sure if I’d get a good image or not with the ISO cranked up such a huge amount. There was a small light above Chris’ decks and the light with a high ISO has given me what I think is a reasonable image. 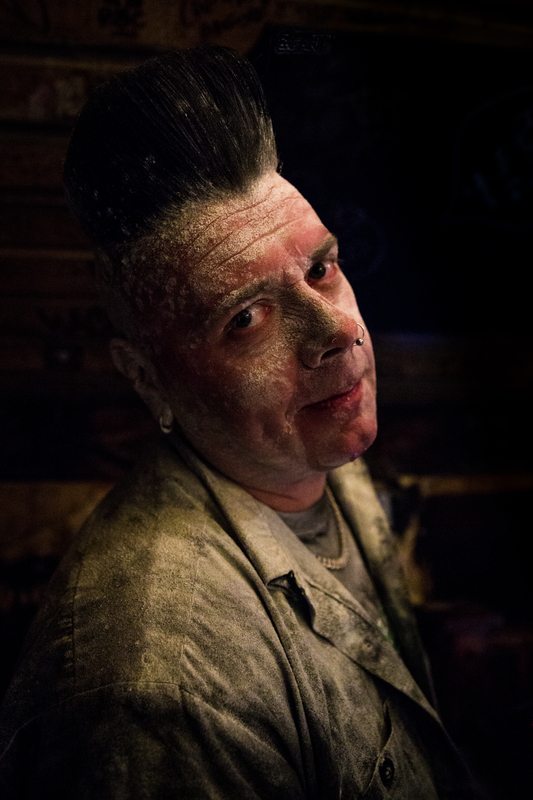 The reason I wanted to photograph Chris is because his hair still looked immaculately fixed but his face and clothes were absolutely caked in flour. His facial expression really made me laugh, its a look of being slightly amused and the acceptance of being covered in flour. (The 12 bar was relocating and the flour-bombs were really only to be expected). I’m so glad I wasn’t in the venue with my camera when the carnage was under way. I certainly wouldn’t have changed lenses in the venue. This picture is #001 in my 100 strangers project. So this is Peter. 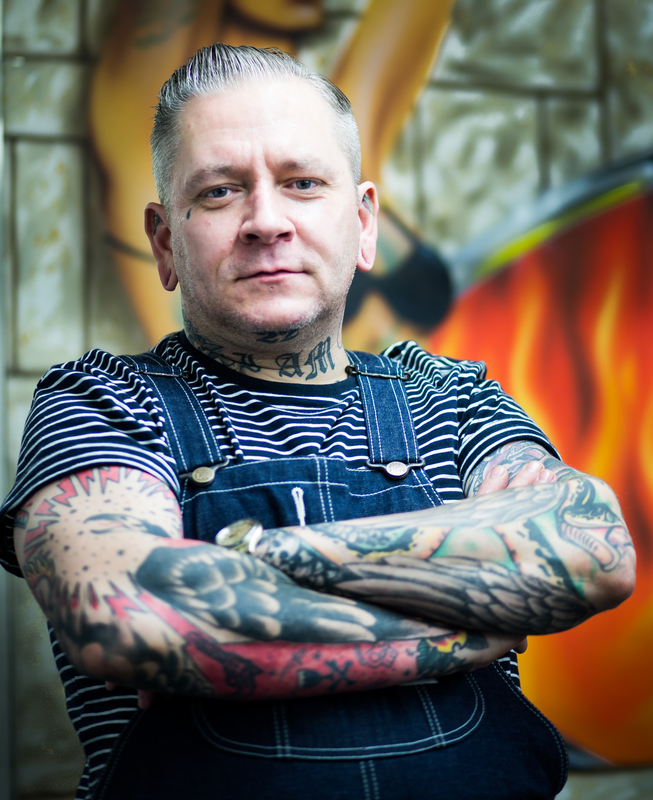 He is a piercer based in London. I meet Peter when I went into a tattoo shop and the tattooist that has done some previous work for me introduced us. I told him that I am learning photography and told him about the 100 strangers project, then asked if I could take his portrait. The reason I wanted to photograph him was simply because I think he has a friendly face. I was pleased that he’d said yes and also relieved that the initial approach was already dealt with by way of an introduction while talking to the tattoo artist. I had to take a few shots to try and get the exposure right as I made a school boy error and forgot to put my settings to a near usable setting following some night photography. I remembered to quickly review the images as I was taking them and noticed that the background was not good in the first shots. It looked like he had things growing out of his head. So I asked him to stand in front of some art work on one of their walls. This was the least noisy place within the shop. My stranger number two is Kat. Kat works at a well known jewellers that makes customised jewellery along with their own designs. I signed up for a photography course and was given a homework task of portraits, landscapes, street photography and a few others. I opted for Street Portraits with the intention of killing two birds with one stone. Homework and joining the 100 strangers group. I was walking around and looking for someone that stood out. 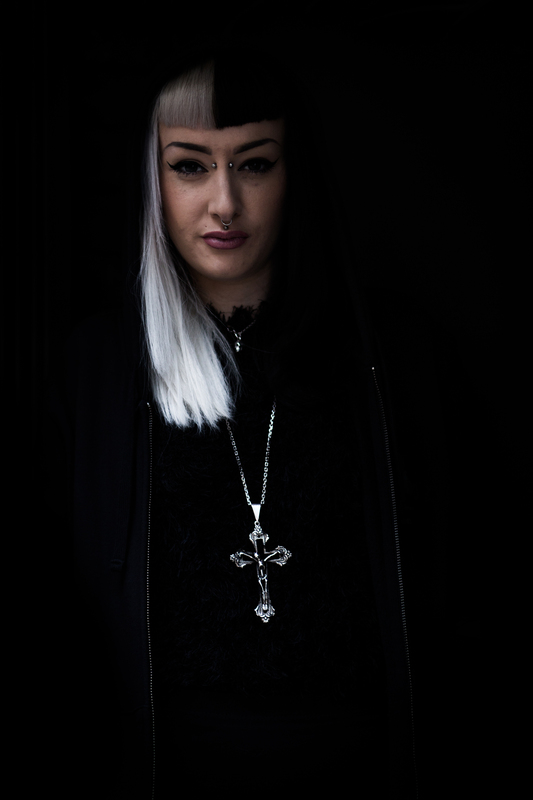 I spotted Kat having her photo taken by a colleague of hers and I guess she was modelling the chain and cross seen in this portrait. As she was about to go back into the shop I quickly asked if I could take her portrait. It was all very quick and I didn’t really have time to think about how I was going to approach her or even what to say. I asked her to step into a doorway that was black as I thought it would be a good background and there were lots of people around that would have been walking between her and the camera. I would like to say that I considered the light but I have to confess that I just got lucky. The conversation was very brief, she was obviously at work and I didn’t want to hold her up. I’m also very pleased I didn’t have time to think about the situation because afterwards I was wondering if a 44 year old man asking a young woman for their portrait maybe a bit weird. I guess I am just going to have to get over that if I want to take images of interesting people. Kat is very pretty and with her style stood out from the mundanely dressed crowd (I include myself in that description). I had to have the images printed for college so told Kat that I would drop of any prints I made. Luckily Kat is aware of Flickr as it turns out she was previously photographed by another member of the group and she kindly agreed for me to take her portrait to be post it here. Thank you Kat for not telling me to bog off! Thats my new project well under way and I will update my progress some time. As always, thank you for stopping to have a look at my blog. Constructive criticism is always welcome and if you like street portraiture please have a look at the flickr group. There are some great photographers showing some wonderful portraits.